They refer to it as the sacred engine. On and on it churns, forever caught in the same dreary cycle of transporting its inhabitants towards no destination of consequence. Those that dwell within – as they have done for seventeen long years – are not so much living as they are existing, and the confined space of a train amplifies the urgency of their merciless class system. The front of the tireless locomotive is a bastion for the wealthy and privileged, while the back, filled with lowly poverty-stricken sorts, is little more than an over-crowded prison. A clear divide between factions is established early on – the same that inspires all obligatory uprisings in stories about imbalanced social structures – but what hope is there for anyone, in any class system, when the world beyond the train offers no hope of perseverance? “Snowpiercer,” a film about such a conflict, ponders those thoughts amidst the deafening prospect that such ordeals may, in fact, be an allegorical projection of the same ill-fated endpoint that we as humanity are habitually headed toward. On a track that leads nowhere, what price would anyone pay for just a few shining moments at the top of a shrinking food chain? This is not your average run-of-the-mill foray into post-apocalyptic movie fables. Directed with dramatic and visual intensity by the audacious Bong Joon-ho, “Snowpiercer” emerges from a place of fearsome ambition, dressed in the skin of a zealous summer blockbuster but equipped with a brain that far exceeds the standards of its classification. That it does such things without retreading to a formula is remarkable given the obvious possibilities; scene after scene is written with narrative tension that suggests platforms are being established for traditional outcomes, but the movie never bows to those pressures. Just as nothing is outside the realm of possibility in these 126 minutes of uncompromising reality, uncertainty clouts every minor twist and impulse afforded to its characters until, in one harrowing moment, all sense of hope is lost. One can imagine a significant portion of today’s audiences walking away with the sense that they have been abandoned in the thick of negative emotions. Those sorts, I’m afraid, may miss the sheer craftsmanship of what they observe. The movie opens without compromise: in the present day, humanity has made an ill-fated attempt to prevent global warming, and effectively caused a devastating new ice age. Most of humanity, as a result, has perished, and the remnants have sought refuge on a locomotive – a train referred to early on as the “Rattling Ark,” no less, which travels a continuous route over the globe without ever stopping. How is such a thing even possible? Is its unending power from some sort of supernatural source? Created by an enigmatic man named Wilford, the train essentially operates as a closed world with its own eco-system, suggesting great power (or manipulation) on part of a leader that the upper class unequivocally worships as some sort of all-knowing deity. Like most yarns in our modern sci-fi fantasy climate (most notably, “The Hunger Games” and “Elysium”), the visual distinctions between the class systems are notable; the lowest ranking of the characters are hygienically unkempt in drab colorless clothing, while the more well-to-do sorts are often seen in bright colors that are characteristic of rude luxury. Most of the notable faces, needless to say, emerge from the back end of the train. Among them: Gilliam (John Hurt), a veteran of the lowest social structure, whose experience with the ruthless ways of the privileged have reduced him to deadpan stares; Edgar, an ambitious youngster who is, seemingly, waiting for the right moment to pounce on his oppressors; and Tanya (Octavia Spencer), a mother who will do just about anything – yes, anything – to protect her young son. 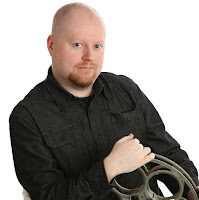 Their endeavors, desires and drive are all projected in a collective uprising bubbling below the surface, and Curtis (Chris Evans) is, it seems, their unanimously elected spearhead of this impending rebellion. What makes him the obvious choice? His temperament is the right mix of dangerous and subdued. He plots, shares information out of strategy, and does not overestimate odds. He observes without calling attention to himself. And when the moment comes for him to act, he has addressed every facet of the resistance, right down to the suspicion that armed guards are, probably, waving around guns that ran out of bullets several years prior. The face of the opposition is an eccentric woman named Mason, an orator whose piercing words serve as a catalyst for the uprising. She is played by Tilda Swinton in a performance that can only be described as flawlessly eccentric; cold and calculated with a veneer of uncertain social awkwardness, she stands proudly on a soapbox to denounce revolt attempts from the low class with sheer scorn, and there is a brilliant moment where her monologue compares the actions of the poor to an attempt at fitting a shoe on a head. This moment also serves, in a way, as a framing device for later dialogue exchanges, and towards the end, the Curtis character offers a confessional that some may indeed find horrific and shocking (though perhaps not at all surprising for some, especially in context with material that sits on the razor’s edge of misery). 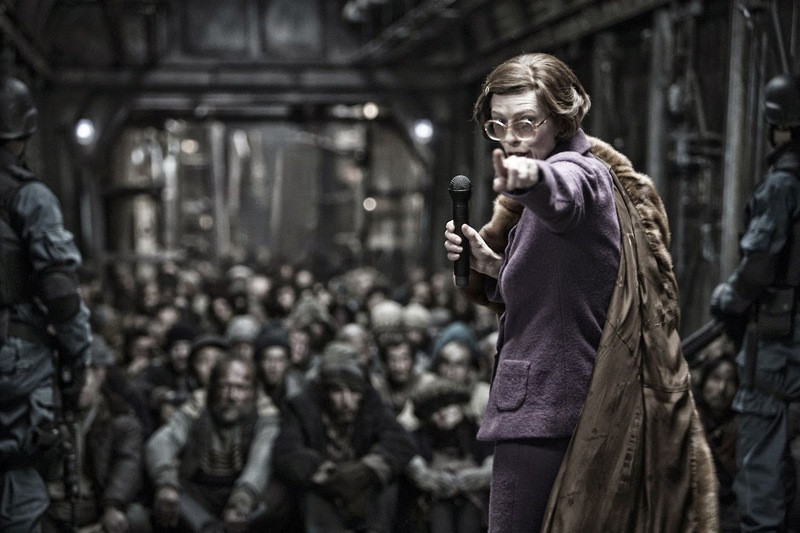 While the dialogue is key in establishing the moral separations of its factions, it is in how the movie balances it with action and performance that “Snowpiercer” finds an oddly powerful tone. Average science fiction will often consider the premise without regard to the focus of its actors; here is a movie that manages both facets with effective precision, and our admiration – or distrust – of certain characters fuels personal stakes in the outcomes of critical scenes. The most effective: an ambitious sequence in the second act in which an unarmed resistance must face off with a wall of soldiers armed with axes, ironically in the same moment when the train will pass through a mountain and cut out all light sources. How will the lowly fighters face off against soldiers armed with night vision? Not since the elaborate knife fight in Martin Scorsese’s “Gangs of New York” has an action sequence been so tense and uncomfortable to watch. The material is based on a French graphic novel called “La Transperceneige,” a fact that lends credence to the ongoing notion that the most inspiring ideas continue to come from comic book writers and artists when other mediums have floundered in narrative innovation. Having not read the source, the movie does come with a couple of its own misgivings; the cinematography by Kyung-pyo Hong tries unsuccessfully to keep up with action in a closed world that allows for little movement (the key battle scene between both factions might have been more resonating had the shaky camera movement not been so disorienting), and the ending, set off by a chain reaction of dramatic events, creates a mark of finality that is misplaced amongst images of optimism and hope. Yet how small these quibbles seem in a grand picture of sweeping imaginative scope, where ideas can be nourishing right alongside effective storytelling and an ambitious display of tension and political insight. Movies like “Snowpiercer” are reminders that the cinema perseveres in exhibiting the promise of new ideas. It is one of the best movies of the year, and surely one of the most thoughtful.